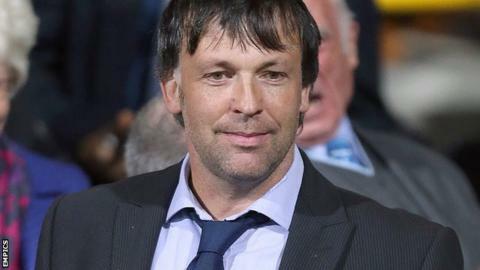 Chairman Karl Oyston says he is the person to blame for Blackpool's current plight as the Seasiders battle relegation from the Championship. The club are 20th in the table, just three points above the drop zone with five matches left to play. A group of supporters protested against Oyston following Tuesday's 3-1 home defeat by Derby at Bloomfield Road. "I'm the head of the company and I'm the one to blame," he told BBC Radio Lancashire. Some fans have accused Oyston of a lack of investment since Blackpool's solitary season in the Premier League in 2010-11. When asked about the possible consequences of relegation, he added: "We've rolled our dice, some would say badly, and in certain cases I would have to fully agree with them. "We've done what we can. All we can do is get the best from the players. "We're not planning for either eventuality. We'll wait and see exactly how we finish before we put concrete plans in place, in certain areas anyway." Blackpool started the campaign well under Paul Ince, holding a place in the top six until the start of December, but then a run of 17 league games without a win resulted in their slide down the table and Ince's dismissal in January. Barry Ferguson has been in temporary charge since Ince's departure, winning two and losing nine of his 15 matches in control of the first team, and Oyston believes it would be unfair to blame the 36-year-old midfielder for Blackpool's predicament. "Hindsight is the most wonderful management tool," he said. "You make the best possible decision you've got in front of you to make at the time. You never make a decision hoping it will go wrong or badly. "Barry's tried to bring people in and improve us, and on the whole he's done well with that. "It's counter-productive to make Barry the focus of people's wrath. If they need someone to shout at, that person should be me. The fans have every right. "They pay their money every year and that gives them the right to have an opinion and express it."